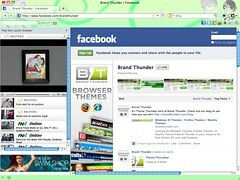 Each month, Brand Thunder releases a number of new Firefox themes and skins for fans of the popular Mozilla web browser. With each new release, we are responding to the demands of our fans and the types of themes they would like to see. It’s an exciting endeavor and certainly rewarding to create new themes for our fans knowing that they will enjoy some of our new creations. A video sidebar highlighting the latest updates from Coach Tressel and Ohio State Footbal.